Measuring the speed/rpm of a Vehicle or a motor has always been a fascinating project for us to try. So, in this project we are going to build one using the Industrial ready PIC microcontrollers. We will use a piece of magnet and a Hall Sensor to measure the speed. There are other ways/sensors to measure the speed but, using a hall sensor is cheap and also can be used on any type of motor/Vehicle. By doing this project we will also enhance our skills in learning PIC16F877A since the project involves the use of Interrupts and Timers. At, the end of this project you will be able to calculate the speed and distances covered by any rotating object and display them on a 16x2 LCD screen. Lets start with this Digital Speedometer and Odometer Circuit with PIC. Before we actually start building the circuit, let us understand how we will be using a Hall sensor and a magnet to calculate the speed of a wheel. 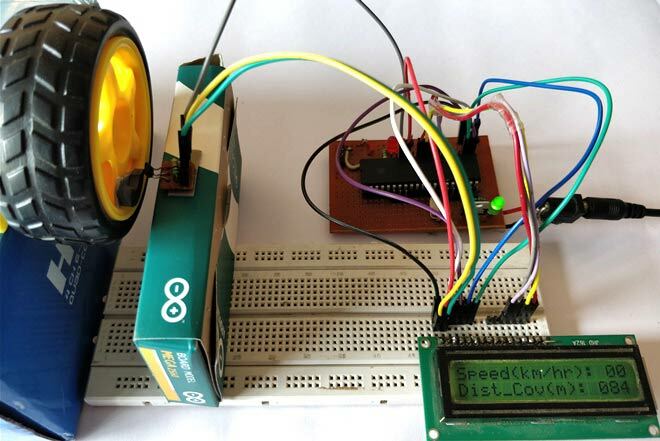 Previously we have used same Technique to build Arduino Speedometer which displays readings on Android Smart Phone. A Hall sensor is a device which can detect the presence of a magnet based on its polarity. We stick a small piece of magnet on the wheel and place the hall sensor near it in such a way that every time the wheel rotates the hall sensor detects it. We then use the help of timers and Interrupts on our PIC Microcontroller to calculate the time taken for one complete rotation of the wheel. Where (1000/timetaken) gives the rps (Revolutions per second) and it is multiplied by 60 to convert rps to rpm (Revolutions per minute). Now to calculate the velocity of the vehicle we have to know the radius of the wheel. In our project we have used a small toy wheel which has a radius of just 3cm. But, we assumed the radius of wheel is to be 30cm (0.3m) so that we can visualize the readings. Once we calculate the velocity we can also calculate the distance covered by using a similar method. With our Hall and magnet arrangement we know that how many times the wheel have rotated. We also know the radius of the wheel, using which we can find the circumference of the wheel, assuming the radius of the wheel to be 0.3m(R) the values of circumference Pi*R*R will be 0.2827. This means that for every time the hall sensor meets the magnet a distance of 0.2827 meters is covered by the wheel. Since, now we know how this project will work lets proceed to our circuit diagram and start building it. The pin connections for the PIC16F877A MCU are given in the table below. As you can see I have used two boxes to place the Motor and a hall sensor in nearby position. You can fix the magnet on your rotating object and intact the hall sensor close to it in such a way that it can detect the magnet. Note: Hall sensor have polarities, so make sure which pole it is detecting and place it accordingly. Also make sure you use a Pull-up resistor with the output pin of the hall sensor. The Simulation for this project is done using Proteus. Since the project involves moving objects it is not possible to demonstrate the complete project using simulation but the working of the LCD can be verified. Simply load the hex file to the Simulation and simulate it. You will be able to notice the LCD working as shown below. To check of the speedometer and odometer are working I have replaced the Hall sensor with a Logic state device. During the simulation you can click on the logic state button to trigger the Interrupt and check if the speed and distance covered is getting updated as shown above. As said earlier we will be using the help of timers and interrupts in the PIC16F877A Microcontroller to calculate the time taken for one complete rotation of the wheel. We have already learnt how to use Timers in our pervious tutorial. I have given the complete code of the project at the end of this article. Further I have explained few important lines below. The below function will get executed each time an Interrupt is detected. We can name the function as per our wish so I have named it as speed_isr(). This program deals with two interrupts one is Timer Interrupt and the other is External Interrupt. Whenever a Timer Interrupt occurs the flag TMR0IF goes high, to clear and reset the interrupt we have to make it low by defining TMR0IF=0 as shown in code below. Similarly when External Interrupt occurs the flag INTF will go high, this also should be cleared by defining INTF=0. The time taken is kept in track by the Timer Interrupt and the External Interrupt determines when the wheel has completed one full rotation. With this data the speed and distance covered by the wheel is calculated during every external Interrupt. Once the speed and distance is calculated they can be simply displayed on the LCD screen using our LCD functions. If you are new to LCDs then refer our interfacing LCD with PIC16F877A MCU tutorial. After you get the Hardware and software ready, simply upload the code to your PIC16F877A. If you are completely new to PIC then you should have to read few tutorials on knowing how to upload the program to a PIC16F877A Microcontroller. I have used a variable POT to adjust the Speed of the Motor for demonstration purpose. You can also use the same of find a real time application. If everything works as expected then you should be able to get the Velocity in Km/Hr and Distance covered in terms of meters as shown in the Video below. Hope you enjoyed the project and got it working. If not you can use the comment section below or the forum to post your doubt. I just compiled the code and dint find any error. What kind of error are you getting. I will be able to help only if I know what error you are facing. Hey Ashwin, I was wondering if this project is viable in real life application or not. because there we have tire is connected to bike with iron type material instead of plastic material. Which power supply is needed ? 5v or 12v ? In that no code is bulid without errors. Could you please give me any suggestions to overcome all errors. frequency please? at what frequency microcontroller will run the hex file? How the value 0.37699 obtained? and why RPM is (1000/TT)*60 what this 1000 means or stands for?